During Camp Meeting, June 13-21, 2014 – the main meetings can be watched on the internet. Simply go to our Minnesota Conference website: www.mnsda.com and watch for our live streaming link. 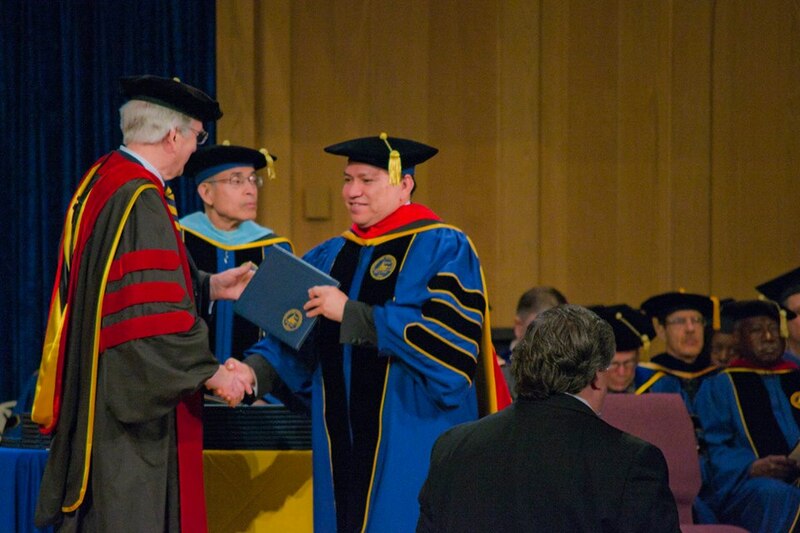 After working seven years on his Doctor of Ministry degree from Andrews University, while raising a family and pastoring full-time, Elder Yulian Tinoco marched with the other graduates, May 1-4, 2014. In 1998, Elder Tinoco moved to the Minnesota Conference from the Michigan Conference. He also served one year as a pastor in Venezuela, South America. Over the last 16 years Elder Tinoco has served the Minnesota Conference, helping to grow the Hispanic ministry. As the Hispanic Coordinator for the last seven years, Elder Tinoco has continued to lead his colleagues in growing and starting church after church. We want to celebrate and commend Elder Yulian Tinoco for reaching this educational mile stone. 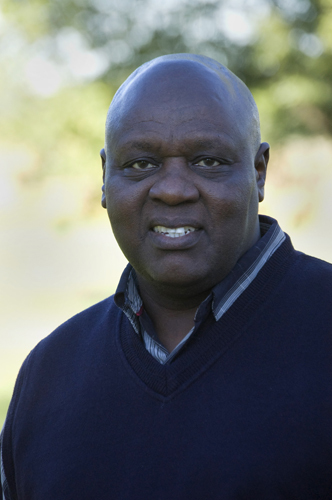 Elder Conrad Vine also received his Doctor of Ministry degree from Andrews University at the May graduation. 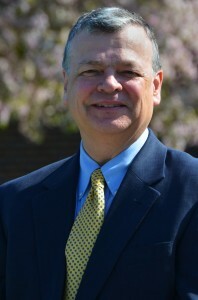 Dr. Vine is currently serving as the President of Adventist Frontier Missions, with headquarters in Berrien Springs, Michigan. 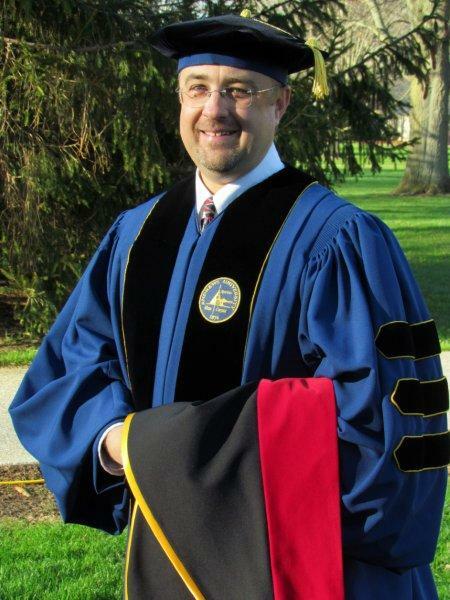 Dr. Vine is finalizing his dissertation for publication by the Review and Herald. Plans are for its publication in the spring of 2015, prior to the General Conference session. As the world changes, so is pastoral ministry. For a minister to succeed in this twenty first century, he or she must not only to be creative, but also go an extra mile in meeting the needs of his or her congregation. You see ministry calls one to not only move out of his or her comfort zone but also learn the art and science of sacrifice. For the two and plus decades that I have been in the United States of America as a student and a minister, I have learned valuable and life changing lessons. It dawned on me long time ago that much as parents with little children desire to make it to Sabbath school on time, the truth of the matter is that “the spirit is willing but the fresh is weak”. Interestingly, the good news is that their children want to make it to Sabbath school on time. There have been cases where I have noticed children shedding tears because they were late to Sabbath school. When we planted Rock of Ages in November 24th, 2012, I made a decision to work extra hard on Sabbath morning. That decision was made much easier by a prior decision when buying a car. I decided to buy a vehicle that would enable me to transport kids and church members who needed a ride. 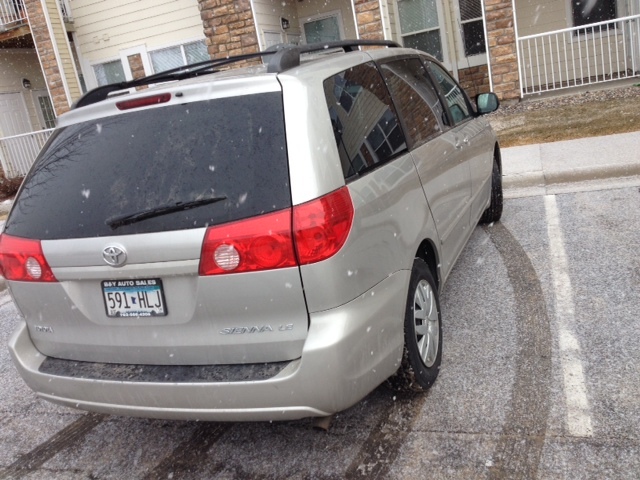 I therefore settled on a seven passenger 2010 Toyota Sienna. Every Sabbath morning, I wake up as early as 5 AM in order to be ready for a busy day ahead in my Father’s vineyard. I usually leave my house before 8:00 AM and go to different homes scattered in the Twin Cities so as to pick my little friends and other church members who have no ride to church. When church is over, I take those who don’t have a car back to their homes. Every minister has a different approach to ministry. As for me, my mind is always searching for new ideas that will yield maximum fruits. So, help me dear God. 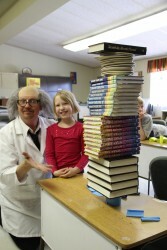 The students at Stone Ridge SDA Christian School spent a day specifically focused on the wonders of science with a visit from Professor SeeMore Science. 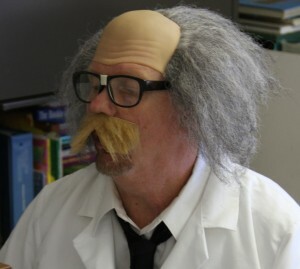 One of teacher Rudy Carlson’s many character roles. The Professor shared with them some of the basic principles of science and showed them how those principles could be used to produce amazing results. After his demonstration he then gave the students items they could use, and a challenge to put the demonstrated principle into practice for themselves. A prize was awarded for the student that was most successful at implementing the principle with the materials available. The Inertia Principle was won when the student’s team was able to make a small car stay on the track. The track’s proper angle kept the car moving fast enough to complete all three loops and not fall off in-between the loops. The Principle of Balance was won when one pad of 3”x3” post-it-notes was made into a tube. 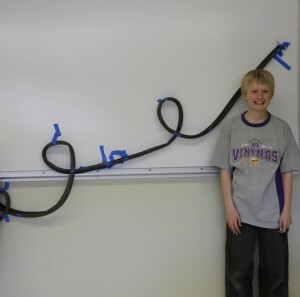 The tube held 37 lbs. of books and plates. If you’re interested in having a science day at your school feel free to contact us at Stone Ridge SDA Christian School and we’ll be happy to share some ideas with you on how to make your day successful and enjoyable. “I had been waiting for a class like this my whole life.” “The class was very inspiring”. “I never thought it would be so easy to give Bible studies.” These were only some of the many positive comments stated by those who completed the first training sessions given by Karen Lewis. In preparation for the city wide 2015 Shawn Boonstra public evangelistic series, Karen Lewis began training lay people on how to give Bible studies using the “Lifting Up Jesus” Bible study series. 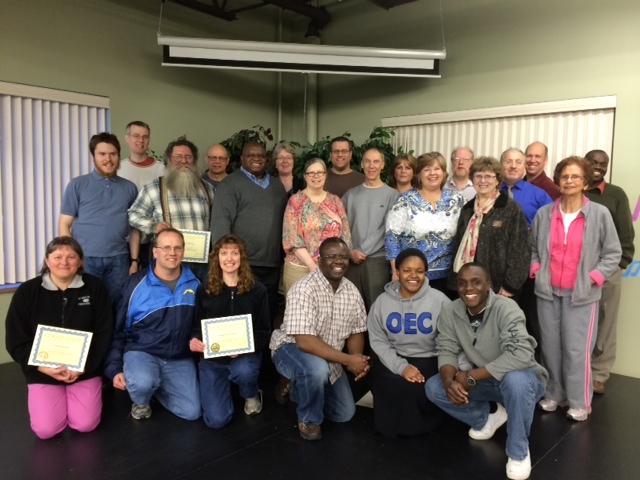 Two classes were held at both the St. Paul First Seventh-day Adventist Church and The Edge Worship Center. The classes began in mid-January and continued once a week for 16 weeks. Students were trained on the importance of lifting up Christ, finding Bible study interests, the importance of discipleship, ten things never to do in a Bible study and much, much more. Despite severe winter conditions, class was only cancelled once while the students faithfully attended each week. Nearly 60 people registered for the classes and currently we have 65 Bible studies going on. Monthly meetings will be held to keep the momentum going and new classes are scheduled for this August at both the Minnetonka and Southview Church. There is a registration fee of $25 for the new class, which includes all materials. For more information please contact Karen Lewis at 303-898-0587. Recently two different church members asked the same question. It indicated to me that perhaps our department has not made its position as clear as we had hoped; so, I hope to clarify this for anyone who might have the same question, but has not asked anyone in our office. The Gift Planning and Trust Services Department remains willing to serve, when appropriate, as trustee for our members who wish to set up a trust. That has always been our policy, and we have no plans to alter that position. What has changed is that we now assist members in establishing self-administered trusts, in which the trustor (person who sets up the trust) acts as his or her own trustee. In cases where the trustor is capable and desires to handle their own affairs, this is often a better method for administering the trust than to add a layer of administration by having our department act in that capacity. So, when setting up new trusts, or when revising older trusts that were set up before this option was available, we discuss this possibility with our members. Perhaps some of the confusion comes from not fully understanding what a trustee is. The trustee is not the entity through whom you have established a trust; the trustee is the person who manages the trust. So it is possible to set up a trust through our department, but administer it yourself, so that the trustee is you, and not the director of the department. We are not attempting to reduce the number of trusts, or the number or type of services we offer. Rather, we have expanded the options for one of our services. And for those who do not wish to make any changes, we are not trying to encourage them to do something that they either cannot do nor desire to do. In all cases, the choice of who will serve as trustee belongs to the church member. We remain willing to serve in any appropriate capacity. If you would like to talk to us about revising a trust or a will, or about setting up an estate plan, or about a gift to the Lord’s work, please call our office at 763-424-8923.